The movie is rated PG. Click here for a detailed examination of the film’s rating. Wikipedia says it well, “The film begins with a Broadway-style number ‘So Long, and Thanks for All the Fish’, sung by the dolphins of the world, who are aware of the Earth's impending doom. At the end, they all jump out of the oceans and into space, leaving Earth for good.” In the book, this isn’t much more than a bit of narration, but this is only one of many differences between the film and book. While this is not unusual, Douglas Adams did co-write the screenplay and some of the changes left me wondering why they had done it that way. The book and the vast majority of the film focus on Arthur Dent. On a Thursday morning during breakfast Arthur discovers that bulldozers have nearly encircled his home and intend to demolish it. He attempts to stop them by lying in the mud in front of the dozers. Ford Prefect, a friend, convinces Arthur the bulldozers won’t bother his home and to go to the pub with him. While there Ford declares that he is an alien from the vicinity of Betelgeuse and that the Earth will be demolished for a hyperspace bypass in just a few minutes. As predicted the world explodes. Thus begins this weird trip around the galaxy. Regarding the work of Douglas Adams, I have found there are two groups, those who believe him to be brilliant and those who wrinkle their noses and go, “huh?” I’m in the wrinkled nose group. I saw the film when it came out in 2005 and left knowing I would never get my money or the nearly two hours of my life back. Recently, a friend convinced me to read the book. I found the story amusing, but the writing not equal to its bestseller status. For this review, I watched the movie a second time. With clarity provided by the novel, the film ranged between amusing and absurd. The majority of scenes in both the film and book are simple attempts to achieve humor, however, there is a subplot that delves into creation. During much of his life Adams described himself as a “radical atheist,” and the subplot pokes fun at the concept of a creator. 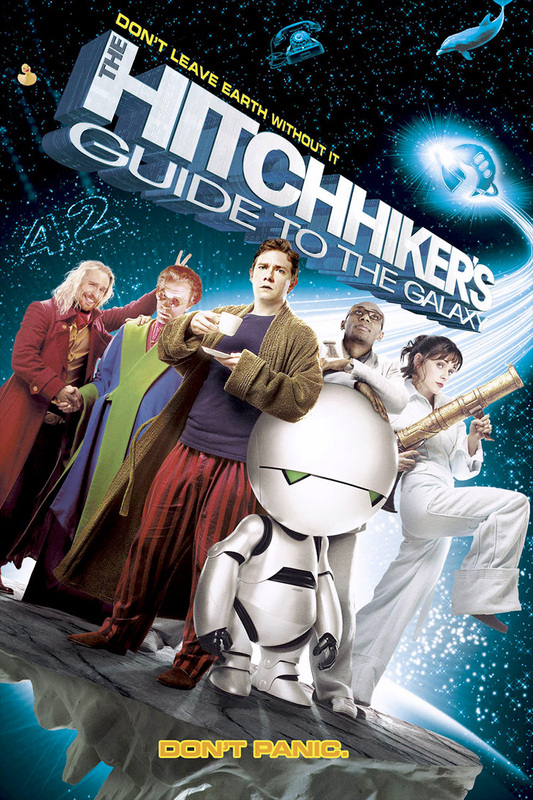 Hitchhiker’s Guide to the Galaxy is much more a comedy than science fiction, but if you enjoy absurd British humor in the form of Monty Python and Red Dwarf you may enjoy this story. However, I’m going to recommend that if you watch it you do so when it is free on free on cable.